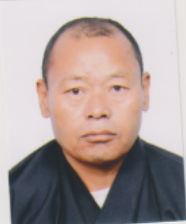 Mr. Man Bdr Rai started his career in the civil service from 16th August 1986 after completion of Diploma from Agriculture and Horticulture Training Institute, Khangma, Trashigang. On his appointment, he was placed as Agriculture Supervisor in one of the Gewogs under Trongsa Dzongkhag. In 1991 he was transferred to NPPC as Plant Protection Supervisor. And later he was also deputed at Paro International Airport as Plant Quarantine Inspector till 1994. When position classification system was introduced by RCSC in 2004, his designation changed to storekeeper. Since then he has been working under the Plant Protection Product unit, which deals with procuring and distribution of pesticides in the country. In the span of 32 years of his service to the Tsa-Wa-Sum, his contributions made with selfless dedication while serving at various places/agencies have been significant ultimately leading to the overall development of agriculture in the country over the last four decades. The NPPC family would like to wish him a healthy, wealthy, long and happy retired life ahead.